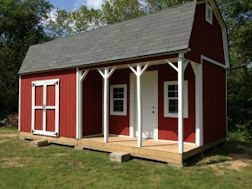 Use these barn shed plans you build yourself a great storage shed, tiny house, shed home, small cabin, playhouse and more! All of my barn shed plans come with my full email support. All plans are instantly downloadable and are in pdf format and come with detailed building guides, materials lists, and they are cheap too! Of all the sheds I have built over the years, I have enjoyed building the gambrel style shed more than any other. It is the most functional and provides the most storage you can get for your money spent. I have always felt that with the loft area in a barn, you are making the best use of your money and it will be well spent when building a nice barn for your storage needs. I would add too that building a barn will do you well for whatever reason you need, be it a utility shed, garden shed, tool shed, or just a workshop. Using it also for whatever hobby you may have, you just can't beat a barn. So, with that said, here is my collection of barn shed plans. You'll find them fun and easy to use, economical because of their price, but more importantly, you will truly be surprised at the abundance of information you receive that is included with the plans. And, you also get email support from me with your purchase! Try finding that anywhere else at these low prices! 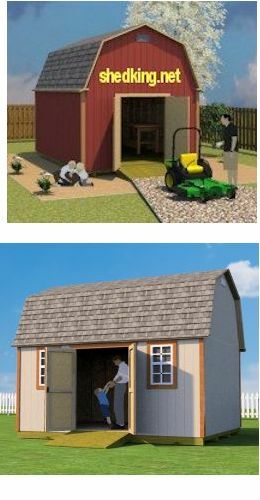 Included in your download for these barn shed plans is a nice sized loft, 6' roll up shed door, 3' side entry door of the 6' wide side porch which can be used for just taking it easy in your favorite rocking chairs, or can even be used for storing firewood. Your instant download for $16.95 includes plans for adding windows, shelving, ramp construction, and the loft built with 2x8 construction. See More information about this 12x16 Barn with porch, or buy now through PayPal using the 'Buy Now' button below for just $16.95. Your plans will be emailed to you via an instant download link which you will receive immediately after you submit your payment using the PayPal button below. These plans come with the option of placing the double shed doors on the end wall, or the longer side wall. If you are looking to build a barn that has 'lots' of storage space, this is it! This barn has 7' tall side walls that can easily be increased up to 8'. I like going with 7' side walls as it makes it really easy to use 4'x8' siding panels and gives you a nice overlap on the bottom of the barn for water protection. Inside if you decide to build the loft that I have included with the plans, you'll have a full 5' from the loft floor up to the inside top of the roof. You can make the size of the loft as big as you want. More specifics and details on this 12x16 small barn. Purchase for $14.95 with the 'Buy Now' button below. 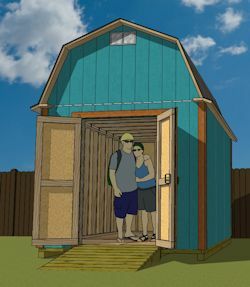 These 12x20 barn shed plans are perfect for building your shed home, tiny house, small cabin, or backyard home office. The interior wall height is 7'1.5", the loft has 5' of head space, the front doors are 5' wide double shed doors. This shed is easily sided with LP smartside siding panels that come pre-primed and are made of engineered wood. The plans come with the option of framing a wooden shed floor or going with a concrete shed floor. 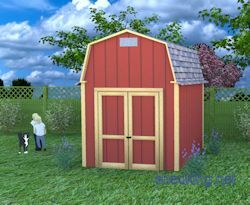 Here's a gambrel roof style shed that is 12' wide x 22' long. The main shed is 12'16' with a 6' front porch. 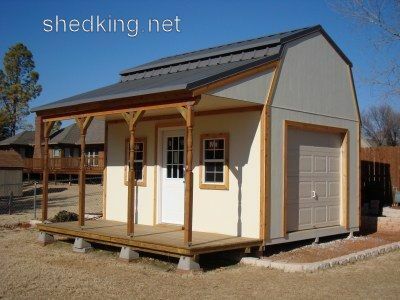 This plan will help you build the perfect shed home, tiny house, small cabin, or just a huge storage shed with a ton of storage space up in the loft area. Purchase below for $29.99 using the buy now button. Download now for $9.95 using the 'Buy Now' button below. This cute little barn is 8x10, has plenty of room in the loft area for storage, features a sturdy shed floor built with all treated lumber and floor joists 12" o.c. More information on this 8x10 small barn. Download now for $6.95 using the 'Buy Now' button below. This 10x10 barn shed has a 5' double shed door on the front and huge loft area that will give you plenty of storage space. All 2x4 lumber construction with LP Smartside engineered pre-primed long lasting siding panels. More information about this 10x10 shed. 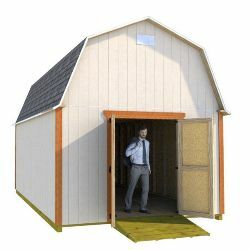 Fun and easy to build gambrel roof style storage shed that has an all treated lumber floor that will last longer then your regular framed shed floor), joists spaced 16" on center for lots of floor load strength, 5' double doors, plans for building a nice sized loft, and plans for adding windows and how to build a sturdy ramp. More information on this 12x12 Gambrel Roof shed. Instant download for only $11.95 using the 'Buy Now' button below. 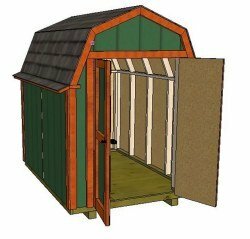 This 6x8 gambrel roof shed is perfect for storing your garden tools in or even for building a nice little chicken coop for your chickens. The 40 pages of plans come with a 20 page small barn building guide, 23 pages of detailed and illustrated full color plan views showing material cuts on all the items shown. 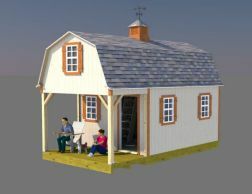 Also included at the end of these barn shed plans is an interactive 3d pdf file that lets you interactively rotate, pan, and zoom in on any framing detail and aspect of this neat little gambrel shed. You also, once again, get email support from me on any questions you may have about these barn shed plans or building aspects of this gambrel shed. 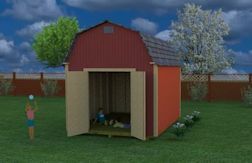 Learn more about this 6x8 gambrel shed or purchase now for $6.95 by using the 'Buy Now' button below. 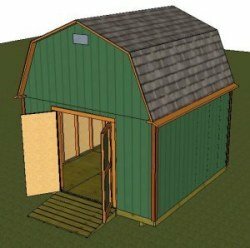 Now these barn shed plans could actually be used for a tiny house! A nice front porch, huge loft area, big 5' double shed doors, and a separate 30" entry door off the porch. 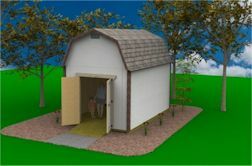 Take a tour around this small barn by downloading an interactive 3d pdf file. You'll need adobe pdf reader version 9.0 or newer. 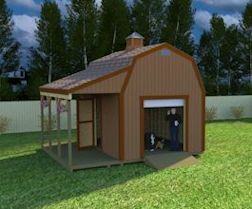 Learn more about this 12x24 Barn shed or purchase for $24.95 with the 'Buy Now' button below. Another small barn that will be so easy for you to build! And talk about being roomy enough to store all your garden stuff in or even build it to use for a small shop. The side wall height gives you enough headroom to walk around easily in. The neat thing about barn sheds is the flexibility you have with the loft space. You can cover the entire loft area with flooring and have a pull down ladder going up to it, or just cover half the loft and have yourself a big open space off any part of the floor you desire. 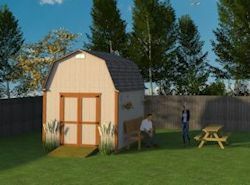 The possibilities of what you can do with this shed are endless and you will see after getting your plans just how easy this backyard storage building will be to build. Learn more about these plans here or purchase with the 'Buy Now' button below for immediate download for just $6.95. These plans are in PDF format and come with email support for any questions you may have about the construction process. This small barn is 8'x12' and is just over 11' tall. It has lots of storage in the loft area which you can make small or big, it's up to you! Once again the framing is all 2x4 lumber with all treated floor and smartside siding panels. You can change the style of siding if preferred. The doors are double shed doors and are 4' wide. Learn more about this 8x12 barn shed, or purchase below for $9.95 using the 'Buy Now' button located below through PayPal and Ejunkie. If you are comfortable building everything on your small barn but need plans for framing the barn style roof? Here's plans for shed roof trusses. All the shed plans here at shedking.